For over sixteen years and now in his late seventies, Charlie continues to give back through Catholic Charities Literacy Program by teaching adults reading and math. Charlie, the accountant-turned-teacher, has learned things too. Charlie’s most recent experience as a volunteer for the program, which assists adults in basic reading, writing and math skills, GED preparation, English language instruction and citizenship education, has taught him how meaningful his work is to others. 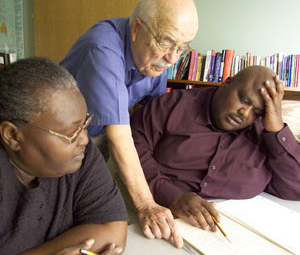 When Theodis, or Teddy, as he’s called, came to Catholic Charities, he could not read. As a high school football star, he was passed through two years of high school before dropping out in his junior year. Employed by the state, Teddy realized that in order to advance, he needed a GED. He is Charlie’s latest work in progress. Teddy is a “let’s-get-down-to-business” guy when he arrives for his one-on-one tutoring sessions with Charlie. “He’s very appreciative. You don’t find appreciative people in the world today,” Charlie says. The encouragement was all Teddy needed to recommit to the idea of earning his GED. Last summer, like other schools, the program took a break. For Teddy, the time off only delayed his GED. So, Charlie agreed to meet Teddy twice a week, two hours a day, just to read. Referred to Catholic Charities by his boss, Teddy has not only kept his job but has taken on added responsibilities. While he perseveres in the program, he gains new skills and most important, new hope. For the sports fan that Teddy is, that’s all the joy in the world.